From the Great Wall of China to meeting with Chinese officials to riding the world’s first commercially operating magnetic levitation train, a delegation of presiding officers from The Council of State Governments Southern Legislative Conference traveled to China at the invitation of the Chinese government. Members of the delegation were Tennessee Senate Majority Leader Mark S. Norris, the SLC chair-elect, Alabama Speaker Seth Hammett, Arkansas Speaker Robbie Wills, Missouri Speaker Ron Richard, Louisiana Speaker Jim Tucker, Virginia Senate Pro Tempore Charles J. Colgan and Arkansas House Majority Leader Steve Harrelson. Colleen Cousineau, SLC executive director, and Sujit CanagaRetna, SLC senior fiscal analyst, staffed the delegation. A delegation of presiding officers from The Council of State Governments Southern Legislative Conference is on its way to China at the invitation of the Chinese government. Members of the delegation are Tennessee Senate Majority Leader Mark S. Norris, the SLC chair-elect, Alabama Speaker Seth Hammett, Arkansas Speaker Robbie Wills, Missouri Speaker Ron Richard, Louisiana Speaker Jim Tucker, Virginia Senate Pro Tempore Charles J. Colgan and Arkansas House Majority Leader Steve Harrelson. Colleen Cousineau, the SLC executive director, and Sujit CanagaRetna, SLC senior fiscal analyst, are staffing the delegation. While in China, the delegation will visit Beijing and Shaghai. The delegation will also attend the 60th anniversary celebrations of the Chinese revolution in Beijing; discussions with a number of high-level Chinese government officials on trade and related issues; a briefing at the U.S. Embassy in Beijing; and touring the Maglev train system in Shanghai, an important element in the high-speed rail discussions surfacing in the U.S.
Stay tuned to Capitol Comments, the CSG blog, for more on the group’s travels. The United States Agency for International Development - USAID - again stressed its support for state to state exchanges for border legislators and state attorneys general through an agreement with The Council of State Governments. USAID in its weekly report April 22 reported that Texas Attorney General Greg Abbott signed a memorandum of understanding with Nuevo Leon State Attorney General Luisa Carlos Trevino committing the two to hold periodic meetings and initiate programs to train law enforcement in all stages of investigation and prosecution of criminal cases. Trevino was receivd on the floor of the Texas State Senate by members of the Border Legislative Conference, USAID reported. The BLC is a joint program of the Council of State Governments-WEST and its regional partner in the South, the Southern Legislative Conference, aimed at enhancing collaboration and communication among state legislators of the United States and Mexico. The agreement between Texas and Nuevo Leon, USAID reported, permits the creation of joint task forces to combat human trafficking and crimes against children. The pact supports continued information sharing between the two attorneys general. The Council of State Governments has a new leader in its Washington, D.C., office. Chris Whatley, who has served CSG as director of international affairs for eight years, has been named Washington Office director effective Aug. 18. In announcing the appointment, CSG Executive Director Dan Sprague said Whatley is well-qualified to lead the office. “Chris has a good understanding of the wide range of Washington, D.C., office responsibilities and is well-prepared for this position,” Sprague said. Whatley joined CSG in November 2000 and has directed international initiatives and federal advocacy campaigns while also serving as staff director for CSG’s affiliated association of international trade directors, The State International Development Organizations, or SIDO. Read the full press release about Whatley's appointment. Alan Sokolow’s 41 years of distinguished service to The Council of State Governments Eastern Regional Conference was recognized Monday by the 12 governors in the CSG/ERC. Connecticut Gov. M. Jodi Rell read a proclamation signed by the chief executives in the ERC states, provinces, territories and Puerto Rico. At the podium with Sokolow were (right to left) Rell, Vermont Gov. Jim Douglas and Delaware Gov. Ruth Ann Minner. The three governors have all served as national presidents of CSG. They also share the experience of being introduced to CSG while serving as legislators, where they first met Sokolow. The retiring director thanked the governors in a heartfelt speech that drew tears and a standing ovation. The time is right for the federal government to pay greater attention to states, metro areas and cities, Philadelphia Mayor Michael K. Nutter said yesterday. In his keynote speech—called Urban Agenda—for The Council of State Governments Eastern Regional Conference annual meeting, Nutter called for the federal government to support creative programs to help urban areas. “There’s no doubt that the winds of change have been beating down on Washington D.C., and there’s no doubt that change is coming very soon,” Nutter said. Nutter described Philadelphia’s successful push to reduce crime and high school dropout rates and increase its population. He said about 25 percent of Philadelphia residents live below the poverty line. The federal government has done too little to support state governments, and states have to work together to be economically successful. That was the sentiment among five Northeastern governors, who said at a roundtable meeting Monday that states need to find creative ways to improve roads, create jobs, lower heating costs and develop alternative energy sources. The roundtable, called Governing in Tough Fiscal Times, featured Gov. Jon Corzine of New Jersey, Gov. M. Jodi Rell of Connecticut, Gov. Ruth Ann Minner of Delaware, Gov. Jim Douglas of Vermont and Gov. Ed Rendell of Pennsylvania. 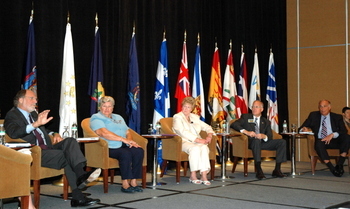 It was held during the annual meeting of The Council of State Governments Eastern Regional Conference. 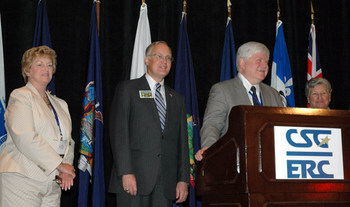 Connecticut deputy House Speaker Bob Godfrey, right, was nominated Sunday as a CSG vice chair candidate by the Eastern Regional Conference executive committee. Godfrey is expected to be appointed vice chair at the CSG annual meeting in Omaha Dec. 4-7. 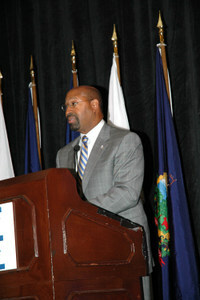 If selected, Godfrey will serve as national CSG chair in 2011. 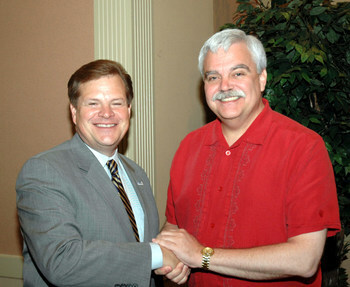 Here he is being congratulated by North Dakota Rep. Kim Koppelman, the 2008 CSG national chair. “When I started in 1967 we were basically 10 states plus the U.S. Virgin Islands. In 1990 we were the first office that attracted a Canadian legislative assembly to join, in this case as an international associate, and that was Quebec. In 1992, there was a point at which Puerto Rico, which had been a member of the Southern Legislative Conference, was probably going to drop out of the CSG world and they were paying partial dues as a commonwealth rather than a state. We made some visits to the then speaker of the House of Puerto Rico and he felt that he wanted to give it one more shot to be seriously involved in CSG, both nationally and regionally through the Eastern office. “I think you saw the connection where there was this large Puerto Rican population in many of the Eastern states, particularly New York, Pennsylvania, Connecticut and New Jersey, plus a lot of federal services to Puerto Rico came out of New York City federal regions, so we added Puerto Rico. A select group of 37 Midwestern lawmakers will gather in Madison, Wis., in August for five days of intense leadership and professional development training. The lawmakers are members of the 14th class of the Bowhay Institute for Legislative Leadership Development, conducted by The Council of State Governments Midwestern Office. BILLD is one of five leadership programs offered through CSG—the Toll Fellows program in the national office and one in each of the four CSG regions.